Don't bring a crowd with you to Mt. Rainier! On this full day small group tour, our dedicated guide will share Washington's most stunning natural scenery with you. Enjoy premium service, door-to-door transportation in a high-roof extended length passenger van, a gourmet lunch, and selected hot and cold beverages. Group sizes are limited to just 4-10 guests per day. At approximately 7:30am your guide for the day will pick you up at your downtown Seattle hotel or preferred location in the area. You'll board our spacious high-roof extended length passenger vehicle for the ride south to Mt. Rainier National Park. As we approach the park, Mt. Rainier will periodically come into view on clear days. You'll enjoy the scenery of the rustic farmland and lowland old growth forests will that surround the mountain as we get closer. During the journey, your guide will share background information about the park itself as well as the area's natural history to put your visit to Mt. Rainier in a broader context of the Pacific Northwest's geologic past. After entering the park, we'll begin to gain elevation and you'll get your first panoramic views of Mt. 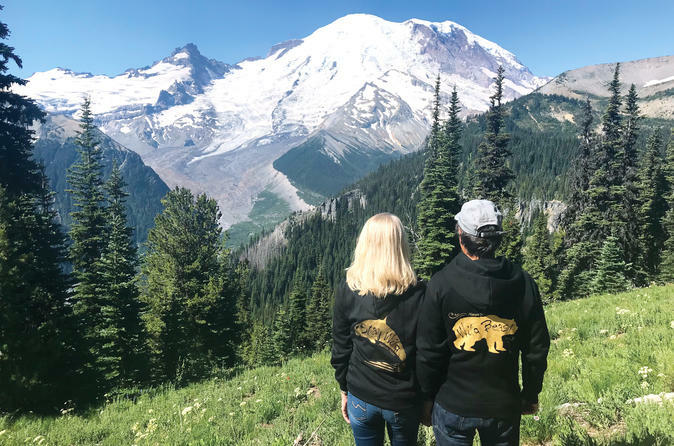 Rainier's glacier clad flanks and summit that towers above us at 14,411 ft. On the way up the mountain, we'll make stops to stretch our legs and breath in our surroundings in an old growth forest of towering trees that have stood for over 800 years. We'll take in plunging waterfalls and rivers fed by glacial run-off heavy with silt, shaping the landscape before our eyes. The highest elevation your tour will reach will be between 5,400 and 6,400 ft. At these heights, you'll be surrounded by the mountain's sub-alpine splendor. Early spring tours will see the mountain still in the midst of winter at these elevations with snow several feet high at the side of the road. Summer tours in July and August will be able to walk through Mt. Rainier's famous expanses of wildflower meadows, and after a short hike, come face to face with some of the mountain's 25 major glaciers--the most of any peak in the US outside of Alaska. Your full time guide will be with you throughout your journey at Mt. Rainier. You'll learn about the mountain's cycle of seasons, how its glaciers formed, how they are continually changing the landscape today, and what's in store for the mountain's future. Around midday, your guide will serve you a delicious catered lunch in the park. No cold, dry sandwiches and bag of chips here! Lunches typically include a selection of steak, salmon, or chicken skewers with sides of vegetables, a fresh green salad, and dessert along with a selection of hot and cold beverages. We happily make meal arrangements for vegetarians, vegans or any other dietary requirements with advanced notice. After about 5 to 6 hours spent within the park, it will be time to head back toward Seattle. On the way back, we'll have a rest stop where you can choose to buy a late afternoon coffee or indulge in some delicious handmade ice cream--almost worth the trip itself! Once back in Seattle, your guide will drop you off at your preferred location in downtown.